As predicted, Israel accepts humiliating ceasefire to bolster partners in Syrian subversion – Egypt, Turkey, & Qatar. 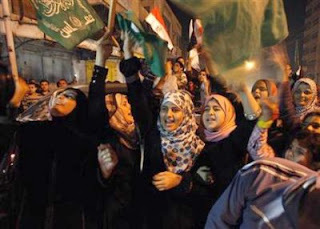 The article featured a photograph of cheering Palestinians in Gaza waving the Egyptian flag, reflecting both the true purpose and success of the Israeli-Gaza charade. Qatar Sheikh Hamad bin Khalifa Al Thani’s conveniently-timed visit to Gaza just days before hostilities erupted was designed to give the despotic Persian Gulf monarchy a boost in both legitimacy and credibility after the conclusion of this staged spectacle – as was highly publicized rhetoric made by Turkey’s Prime Minister Recep Tayyip Erdogan against Israel. Egypt, Qatar, and Turkey, all in fact partners with Israel and its Western sponsors in the subversion and overthrow of Syria, now have a renewed popular mandate across the Arab World, as a direct result of Israel’s premeditated, predictable failure in Gaza. 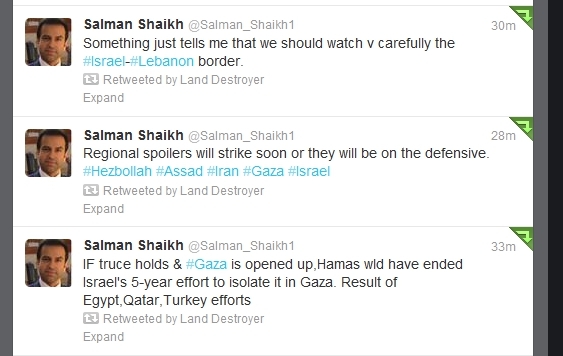 By “regional spoilers,” Shaikh meant Hezbollah in Lebanon, as well as Syria, and Iran. And as Israel concedes to a humiliating ceasefire after another exercise in futile but destructive brutality, with some Israeli protesters allegedly incensed and taking to the streets in protest, one can almost make out the smirk on Israeli Prime Minister Benjamin Netanyahu’s face, as his regional co-conspirators receive a PR boost that will be essential in the upcoming weeks as the West, including Israel, pivots back toward achieving the overthrow of neighboring Syria. It should be noted that Shaikh, of the Brookings Institution’s Doha Center, has been heavily involved in the enumerating and documentation of Western designs against Syria – and is in fact based in the allegedly anti-Israeli nation of Qatar. He was the co-author of the Brookings Saban Center, Middle East Memo #21 “Assessing Options for Regime Change (.pdf), which articulated plans involving the carving out of “safe havens” within Syrian territory along the Turkish border and a coordinated campaign by both Turkey and Israel to pressure Syria’s borders to exact defections within Syria’s military ranks. The report was written in March 2012, and since then, both Turkey and Israel have demonstrably coordinated efforts to apply pressure on Syria’s borders. With a strategic defeat of Israel by what the Washington Post calls “a changed Middle East,” the Saudi-Qatari-Egyptian-Turkey axis, a united front of sectarian-hardliners long-sought by Wall Street and London to fight its regional enemies, will be better prepared to confront Iran, Syria, and Hezbollah in Lebanon – to accomplish what the US and Israel have themselves already tried but failed to achieve. “Fenced in by an Israeli blockade and by the tacit consent of authoritarian Arab regimes that disdained Hamas’s Islamist politics, the group long relied on two international pariahs — Iran and Syria — for support. But the outbreak of a revolt in Syria shattered ties between Hamas and the government of President Bashar al-Assad and forced a rift between Hamas and Shiite Iran. Hamas has since repositioned itself, gaining a new set of regional partners at a critical time. Now, the focus is shifting away from Iran and to the “winners” of the Arab spring. Now, their commitment to a new foreign policy for a New Middle East will be tested. Will Egyptian President Mohammed Morsi and his Muslim Brotherhood pursue a more assertive policy vis-a-vis Israel compared to that of former president Hosni Mubarak? If there is more continuity than change in Egypt’s Israel policy, how will that affect Mr. Morsi’s apparent bid for regional leadership – or his hold on power at home? Will Turkish prime minister Recep Tayyip Erdogan’s new role as the champion of the Sunni Arabs following his aggressive opposition to Mr. Assad survive if he fails to re-adopt his pre-Syria assertiveness against Israel’s Gaza policy? If he fails, will it prove that Mr. Erdogan’s Syria policy has weakened the “arc of resistance” and strengthened Israel regionally? Tehran certainly seems to hope that this will be the conclusion many in the region will reach. Additional op-eds across the Western press are sure to be rolled out over the next week, hailing the “new Middle East’s” triumph during the Israeli-Gaza conflict. US President Barack Obama has already praised the Western-installed and backed regime in Cairo, Egypt, for its role in “mediating” the cease fire. Following the afterglow of this manufactured US-Israeli PR coup for its regional Arab and Turkish partners, a renewed push against Syria will ensue. Israeli-Gaza Conflict – A Propagandist 2 for 1 Special. While this “new Middle East” victory narrative is geared toward the Muslim World, and more specifically the Arab World in order to bolster support for a final push on Syria, another narrative is making its way through Neo-Conservative propaganda channels, including WorldNetDaily, Brietbart, and Fox News. Even as the West’s regional allies take full responsibility for bolstering Gaza during the recent conflict, it is being reported by Neo-Con fronts that not only did Gaza start the conflict, but that it was Iranian and Syrian weapons that enabled it. Despite Hamas turning its back on both Iran and Syria, going as far as closing their offices in Damascus and rhetorically supporting the US-Israeli-Saudi backed terrorists now ravaging the country, the Western media has found a way to both diminish the role of Iran and Syria in the eyes of the Arab World, while continuing to demonize them as key aggressors against Israel in front of Western audiences. On the Eve of Another Psy-Op Versus Syria. Corporate-funded think-tank and purveyor of US foreign policy, the Brookings Institution, had in 2009 blueprinted the strategy with which the West would slowly strangle and topple the government of Iran. Throughout the pages of their report, “Which Path to Persia?” everything from sanctions, to purposefully provoking war with Iran, to stoking US-backed uprisings, to funding, training, and arming US State Department-listed terror organizations was plotted before being promptly executed. The West purposefully destabilized Syria, and is currently perpetuating extensive bloodshed through militant proxies funded, trained, and armed by the West and operating on Syria’s borders as well as within Syria itself. As the bloodshed mounts, the West is now insidiously using the carnage to justify more overt intervention to execute long planned regime change. Just as it was spelled out and promptly executed in O’Hanlon’s “Which Path to Persia?,” the operation in Syria involves almost identical elements altered only slightly to suit Syria’s geopolitical predisposition. US-backed uprisings, armed militants, and sanctions have all already been set in motion with overt military options being all that is left on the table. What must be remembered is that O’Hanlon is not writing this for the consideration of the Pentagon. Instead, he is specifically writing this so that pundits and media outlets can repeat what is essentially extortion directed at Syria’s establishment. The purpose of this exercise is to prey on the fear of President Assad’s political allies and those across Syria’s business community who have so far stood behind their nation’s government. It is hoped that the West can bluff their way into folding opposition by presenting them with a difficult and costly military campaign versus the alternative of “power sharing.” Unfortunately for US policy makers, Syria has already seen the dead end “power sharing” led to in Libya, a dead end Libya will remain in well into the foreseeable future. The rationale of businessmen capitulating to see UN sanctions relieved is also absurd considering the inevitable fracturing and perpetual destabilization that will wreck both the country and its economy should the current government fall. Image: General Abdul Fattah Younis‘ reward for accepting offers to “power share” with the Libyan rebels was his assassination. Syria’s opposition is entirely dependent on foreign fighters, foreign arms, foreign funds, and an international consensus that allows such foreign resources to continue flowing to them unabated. Already severe cracks have begun to show and now the West’s only chance is to psychologically break Syrian President Bashar al-Assad’s power base through threats and perhaps even a limited military incursion. The catch is, should Syria remain united, order can be restored and nothing short of total war waged by the West could prevent it. Syria Still has Only One Option. While in reality it would likewise suit President Assad’s opponents, it is particularly important for those who have made the decision to stand by Syria’s ruling government to stay the course of restoring order and pursuing political solutions. The West has gone too far, its credibility and operational capacity waning by the day, it has no choice but to continue pushing forward in hopes that all before it lack the fortitude to stand up and fight. The West will not stop until either Syria is divided and destroyed or the West itself crumbles in the midst of its untenable imperial conquest. Defection, capitulation, and failure are not options. Syria’s fate will be that of Libya, Iraq, Afghanistan, or worse if it falls. Unity has been and still is Syria’s only option.